FITTING INSTRUCTIONS 90/110 R380 GEAR BOX. The Mat system is designed to replace all the existing trim in the areas it covers. But in later models the standard trim, in the bulkhead and foot wells is quite extensive, although it is not as affective as the Polyurethane (PU) system. It will add to the sound deadening but also absorb moisture. Owners of older vehicles will vouch for this and may wish to remove it. In the case of a rebuild, it could be left out. Please bear in mind that there is a lot of variation in the floor area. The bulkhead mat is fitted behind the fuse box. Remove the cover and un-fix the box/plate from the bulkhead. It may be possible to fit the bulkhead mat over the existing trim in later models, dependant on how your floor panels are fitted. 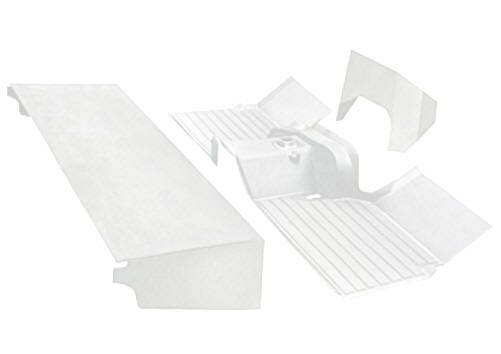 In later models it is preferred that the mat system be interfaced with the existing trim by cutting out the areas covered by the mat and leaving the remainder in place. This is best done with the trim in place using a HD craft knife. PLEASE BE CAREFUL, AVOID CUTTING HIDDEN WIRING AND YOURSELF. Feed the mat behind the wiring and place against the bulkhead then re-fix the box. No glue is required. Leave the cover off until the floor mat is fitted. On the reverse of the mat are recessed locations for the air con pipes. It is supplied as a blank, and requires cutting to suit your requirements. It will give the best acoustic properties if it is fitted as it is but you may require access to the seat box panels. You will also need to remove the seats, handbrake lever and gaiter. Any cutting should be done with a Stanley/heavy duty craft knife, make sure you use a new blade and you have a supply of new blades, will need to replace it shortly. As the mat is so dense, it will blunt blades quickly. You can use oil to lubricate the blade, the oil will not affect the mat. Position the mat on the seat box and mark through from underneath the seat and handbrake fixing holes to double check positions. Then move it towards the front, keeping it parallel to the rear edge of the seat box, expose the lids and seat fixing holes. These positions can then be transferred to the mat. Use the lid as a template to cut around. Its up to you how you cut the panels, The cut piece can be left attached with a hinge, fixed to the lid or lifted out when access is required. You could also remove all the hasps. PLEASE BE CAREFUL, USE A STEEL STRAIGHT EDGE TO CUT AGAINST. Best method is to cut through in two or three passes. If you have an untidy cut edge you can sand it with a medium/fine grade paper. You may need to cut a slit for the ECU plug bracket, drill a hole large enough to pass the plug through. The seat frame/runners can then be bolted down on top of the mat, Use locking nuts and don’t over tighten, as the mat will deform excessively. Make sure the seat slide rails work and engage properly. Use the existing spacers or super glue a stack of washers together. Depending on the seats you are using, you may need to cut a lid panel to allow the seat to be fixed. Suggested cut marks are also shown to provide clearance for lower seat belt anchor points. Leave the handbrake and gaiter off until the floor mat is fitted. The floor mat should be fitted last. Firstly remove the gear lever gaiter, a new cable tie is supplied. You will need the piece of foam that goes under the gaiter. It provides the sound deadening for the top of the gearbox. You can treat the floor area to rust proofing if you are concerned about trapped water. Wax oil is probably the best and can now be used on the inside floor area under the mat. Lower the mat over the gear lever, angled downwards at the front. Aim the leading edge under the pedals and feed the gear lever through hole. Make sure the leading edge of the mat is pointing upwards towards the fuse box. Refit the gearlever gaiter using the new cable tie. Once the mat is in place on the seat box with the entire cutting complete, you can re-fit the hand brake lever and gaiter. Refit the fuse box cover.